Jake is having a Minecraft party this evening with four boys here. 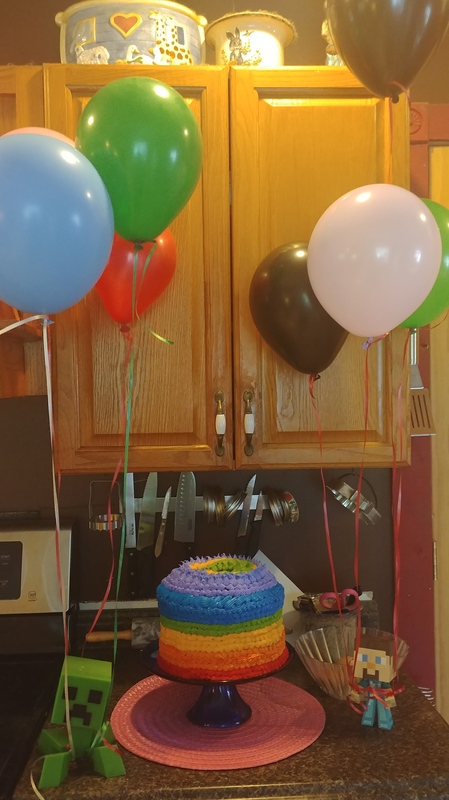 He designed this party to celebrate the release of the Minecraft World of Color update (launched today), and I made the cake he designed! I think I did pretty well. I cheated because I am still working so I couldn’t do it all from scratch. I bought two pudding cakes from Kroger and two containers of buttercream frosting for the Kroger bakery. Then I sliced the top off of one cake to flatten it, slapped on icing, and topped it with the other cake. Then I colored the rest of the icing and used one of the cake decorating tips I had to create the rainbow stripes (stuck the tip inside a plastic baggie with the corner snipped off and washed the tip in between each primary color). ← What’s eating my broccoli? ?